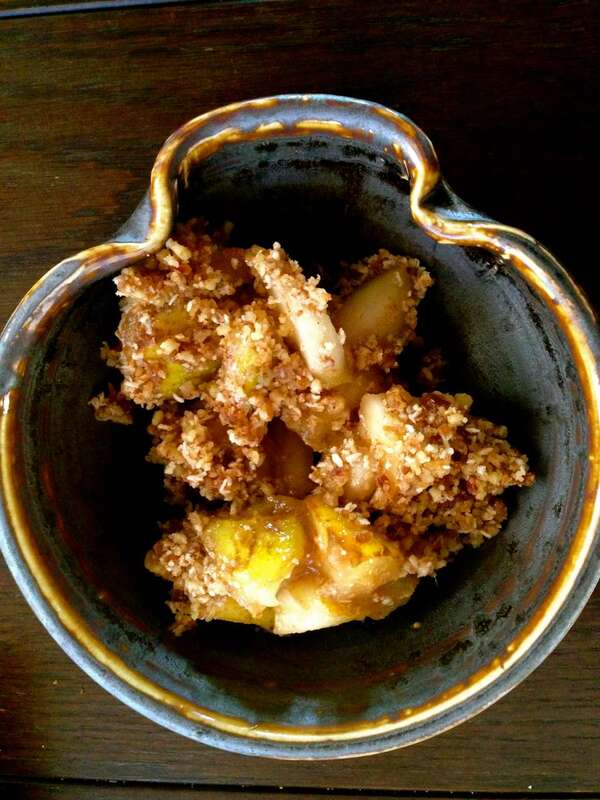 This easy, gluten-free, raw pear cobbler recipe is perfect in the fall when pears are at their sweet, juicy best. Pecans, walnuts, coconut, dates, spices, and pure organic extracts create a lovely crumble topping with lots of flavor. The cobbler holds nicely for a couple of days in the refrigerator and can be eaten on its own or paired up with a topping. For those of you who want something creamy as an accompaniment, try Vanilla Tofu Whip, Walnut Cream or Almond Cream. Gently toss the fruit with the agave, lemon zest and juice, ginger, and vanilla extract. Divide the fruit amongst 4 dessert glasses (or place in a single 8” serving dish) and set aside. Place the remaining ingredients — coconut, walnuts, pecans, dates, almond extract, cinnamon, ginger, cloves, nutmeg, and salt — in a food processor and pulse the mixture until it is coarsely ground but still has texture. Divide the mixture between the 4 dessert dishes, scattering evenly over the top to form a thick “crust”.